This page provides detailed guidance on how to install the Banana Plugs available within our online store. In most cases this is actually quite simple once correct preparations are made and a small amount of practice is committed. 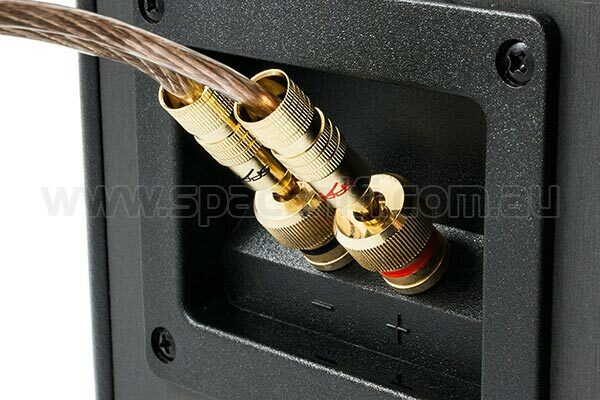 We will outline the entire process from selecting the correct banana plug stripping and terminating the speaker cable, right up to connecting your speakers and amplifier (or AV receiver). The angle of approach for the speaker cable. Overall finish & quality of the banana plug. 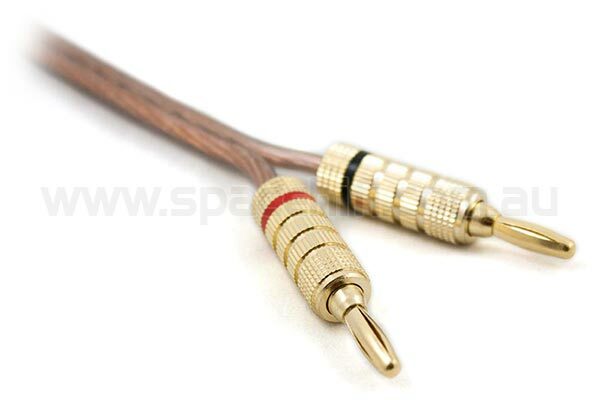 Out of the considerations listed above, probably one of the most important factors when selecting banana plugs will be the thickness of the Speaker Cable that you plan to use. All of our banana plugs are listed with measurements for the available entry points and are also provided with a number of images to assist you in making the correct decision. Next, you will need to consider the angle in which the speaker cable will approach the speaker terminals (binding posts). While for most systems, using a banana plug with a rear entry point will be suitable, there are some scenarios (wall mounted speakers etc.) where a banana plug with a side entry may be preferred. While most banana plugs are quite easy to use once you understand the manner in which the speaker cable should be terminated, there are certainly those that may appeal more due to ease of use. We recommend thorough examination by reading the product description and viewing each of our available product images to discern which option may work best for you. All of our banana plugs are of the highest quality standard and are precision manufactured with brass (copper and zinc alloy). The 24k gold plating will also ensure that the connection will provide longevity and will not corrode over time. Other important factors to consider are the materials used for manufacturing (plastic, metal etc.) and general workmanship. For example, does the screw appear to work smoothly or does it feel a little rough? If the screw mechanism does feel a little rough, this would be a sign of lower quality manufacturing standards. The general feel of the metal finish will also provide insight as to the quality. If the finish appears rough instead of smooth, this is also an indication of poor workmanship. There is not a whole lot to cover in this area but there are a few suggestions that we can offer to help you complete installation of your new banana plugs with as much ease as possible. As most audio systems reside in an entertainment unit, s suitable light source is often scarce. When you do finally come to the stage of installing the banana plugs, it may save a lot of frustration by ensuring that a simple compact torch is available. In the preparation stages, you will need to strip the wire ready to be inserted into the connector. A traditional wire stripper can perform this task quite well. 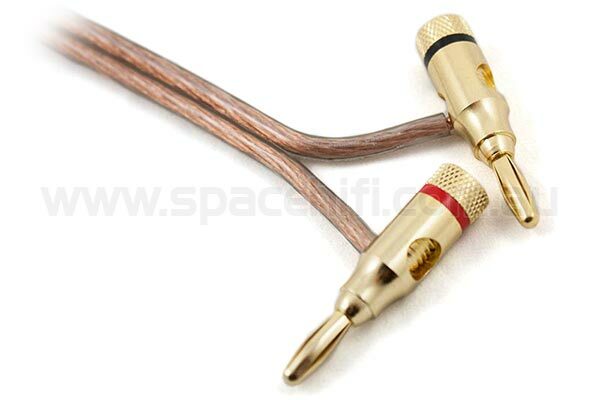 However, there are specialised tools available which can strip the outer PVC jacket from the speaker cable with ease. One example is the Weidmuller Stripax. If you do not have access to either of these tools, you can use a razor blade or scissors but care must be taken to ensure that the inner strands are not cut while stripping the outer jacket. 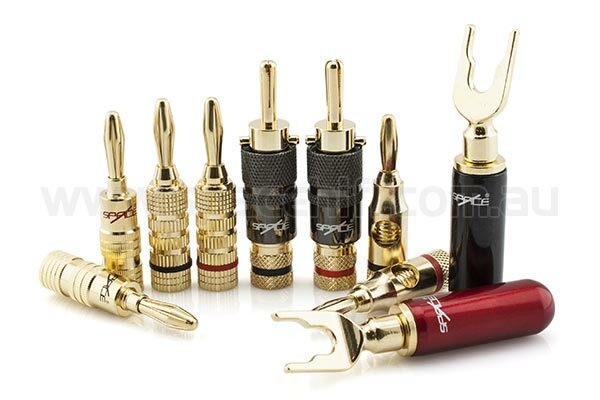 You may also need a precision screwdriver (depending on the type of connector that you have selected) to tighten the screw locking fasteners in order to secure the speaker cable. Note: When stripping wire and preparing the banana plugs always take note of polarity (positive and negative). Although there is no set rule as to which colour the tracer wire must belong to, it is of utmost importance to ensure consistency across your installation. For example, if you select the tracer wire to go into a red coloured banana plug, then you will need to ensure that this is followed throughout your installation. Otherwise your speakers will be wired out of phase. 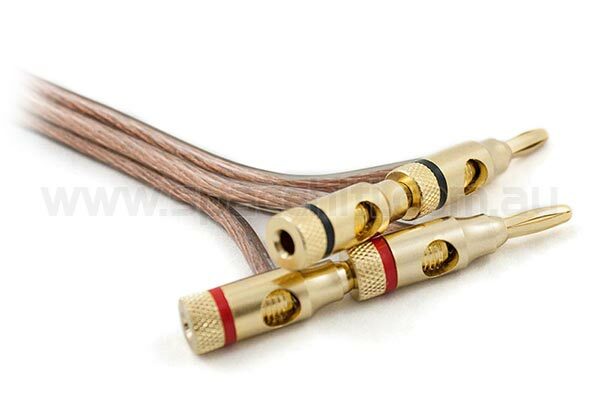 This type of connector features either one or two screw locking fasteners on an internal chamber which secures the speaker cable in place. 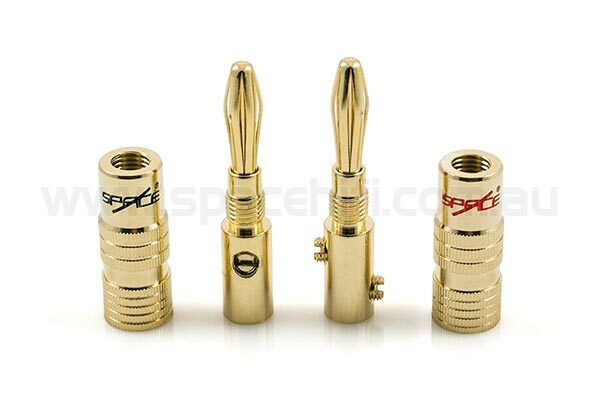 Some examples of this type of connector are our IntraLock Banana Plugs, Dual SpaceLock Banana Plugs or SuperLock Banana Plugs. Tools Required: Wire stripper, precision screwdriver (standard flat head) and a torch (optional). Strip the appropriate amount of wire from each conductor (approximately 12mm is recommended). Remove the outer section of the banana plug with a twisting motion to reveal the inner chamber. Loosen the screw locking fasteners on each plug (be careful not to remove the screw completely). Insert the speaker cable into the banana plug with minimum force until you feel the wire touch the end of the chamber. Tighten the screw locking fasteners. Replace the outer section to conceal the inner chamber. Insert the banana plugs into the binding posts. Both the closed screw and open screw type of banana plugs are similar in the manner in which the cable is terminated. Both feature a rear section that can be removed to allow the cable to enter the plug which is effectively clamped internally. The primary difference is that the closed screw type features a completely enclosed outer chamber, while the open screw type also features a side entry point to provide a more versatile solution. An example of the closed screw type are our UltraLock Banana Plugs and an example of the open screw type are our HyperLock Banana Plugs. Tools Required: Wire stripper and a torch (optional). 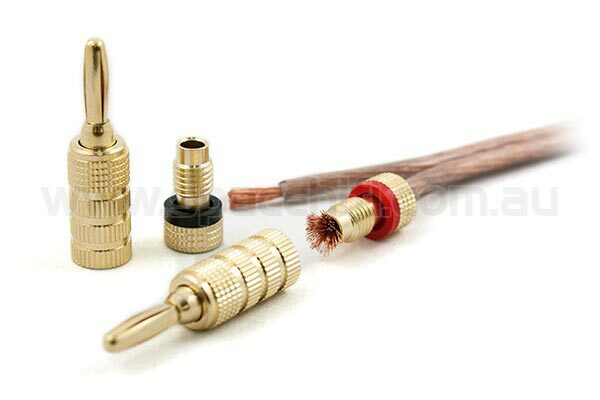 There are two primary methods used to terminate the cable with this type of plug. The first method requires the conductor strands to be doubled over, which then provides the plug enough wire volume to clamp the cable effectively. The second method secures the strands over the side of the threaded section, which is then clamped securely by the plug. Strip the appropriate amount of wire from each conductor (approximately 30mm is recommended). Fold the exposed cable over at the half way point, doubling the amount of strands available for the plug to clamp onto. Unscrew the top section of the banana plug from the bottom. Insert the speaker cable into the rear of the bottom section until all the stripped speaker cable protrudes. Create a small ball like shape with the exposed strands to allow the plug to clamp effectively. Screw the top piece back on which will act as a clamp for the speaker cable prepared in the previous step. Insert banana plugs into the binding posts on the speakers and/or amplifier (or AV receiver). Strip the appropriate amount of wire from each conductor (approximately 15mm is recommended). Insert the speaker cable into the rear of the bottom section until the speaker cable protrudes about 3mm to 5mm. Gently spread and fold the wires over the circumference of the bottom piece. Note: For cable that is under 12 AWG, method 1 may be required for secure termination. Twist the strands of the speaker cable so they are tight. Fold the twisted wire into an L shape bending at approximately one third of the exposed wire (4mm to the PVC section and 8mm to be inserted into the plug). Unscrew the top section of the about 50% of the way. Insert the speaker cable into the side entry point with the L shape pointing into the bottom section. Note: When using the side entry point it is possible to also use the rear entry point to piggy back another set of banana plugs for bi-wiring.